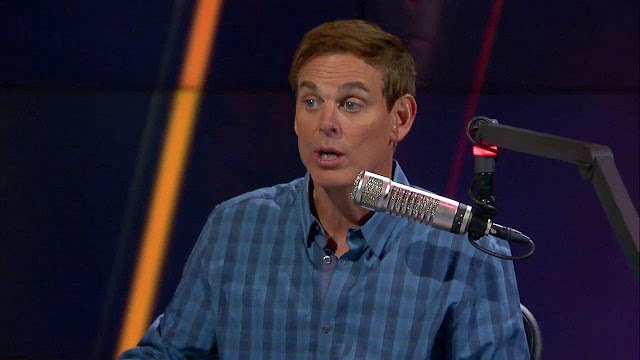 Radio host Colin Cowherd likes to say things that will get people to talk. That's his thing, as it is with a lot of TV and radio personalities. He's said things about the Patriots in the past that many have called him out on, particularly that Tom Brady and Bill Belichick hate each other. No one really thinks that's true, but I guess if that gets him ratings, then that's all well and good. This time, Cowherd said the Pats 17-year run has to do with a couple lucky breaks. And while this is sure to piss some Pats fans off (because I'd be willing to bet some will see this as Cowherd saying they don't deserve as much credit for their success as they get), nothing he said is really wrong here. Think about it - Belichick resigning as Jets coach in 2000 just one day after taking the job never happens. At the time, people killed Robert Kraft for hiring him, but the negativity surrounding his tenure in Cleveland in the early 90s is overblown. He also passed on Tom Brady five times before drafting him. Any team in the league could have had him on five different occasions in the 2000 NFL Draft. You could say the same about a million different players, but when you're talking about the greatest quarterback of all time, it makes you look even luckier. The AFC East has been fairly terrible as a whole for a lot of this run, save for a couple of years when the Jets were good early in Rex Ryan's tenure as head coach there. The Bills haven't made the playoffs since 1999 and the Dolphins have made the playoffs only a few times and have had early exits each time. The Patriots go into those games, as Cowherd said, knowing they're better. The cold weather thing I'll give him to an extent. It's true that the Patriots have played teams who play primarily in a dome or in warm weather climates in the playoffs, which gives them an advantage. But it doesn't necessarily help against teams like Pittsburgh, Baltimore, the Jets, etc., who have all come to New England for playoff games. The Super Bowl, save for the one in New York a few years ago, is always in a dome or a warm climate, so it doesn't exactly give them an advantage there. I don't think Cowherd is dismissing New England's success. This type of sustained excellence doesn't happen by chance. But how it came to be is another story. It's one that definitely did take some luck, but what success story in any facet of life doesn't have a little luck involved?